A thermal pool in this weather? Yes, please! And so we suited up and entered Hastings thermal pool with anticipation. I was so looking forward to a relaxing soak like we’d experienced in New Zealand, and so the tepid water disappointed me. Our girls, however, were thrilled to be at a pool again, and spent five (5!) hours in the water. 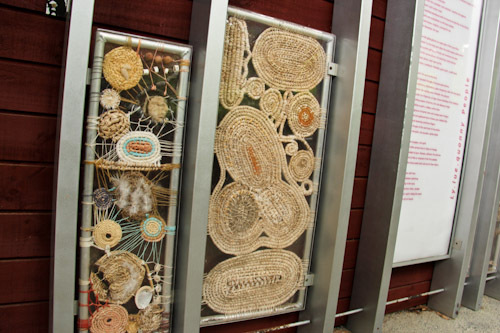 Intricate weaving accessorises a plaque detailing the history of the local Indigenous Tasmanians who were deliberately, systematically, chased and exiled from Tasmania. 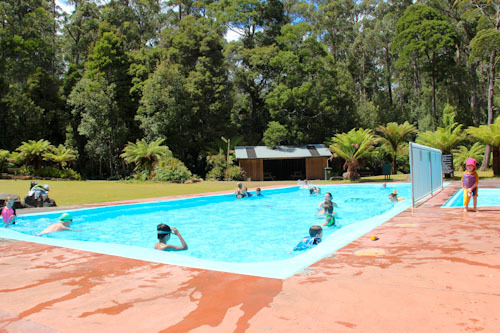 The thermal pool is a small outdoor pool kept at around 28 degrees C.
The Hastings thermal spring feeds the pool water which is purified and cleaned with ultra-violet rays and hydrogen peroxide instead of chlorine. Calista's swimming improves each time she has the opportunity to swim in deeper water, and although she's spending most of the time on the steps, she does swim out every now and again. In experimenting with her toy, Brioni confirms that the wooden robot floats. 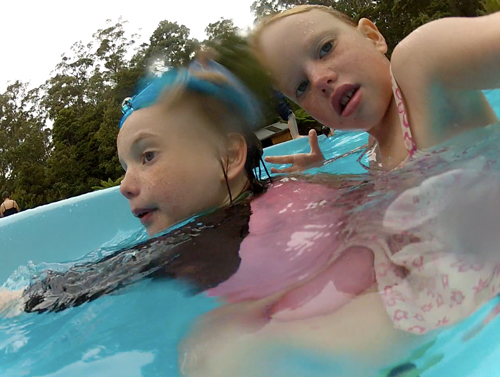 Brioni also has fun with the waterproof camera but somehow changes its recording settings from pictures to video. 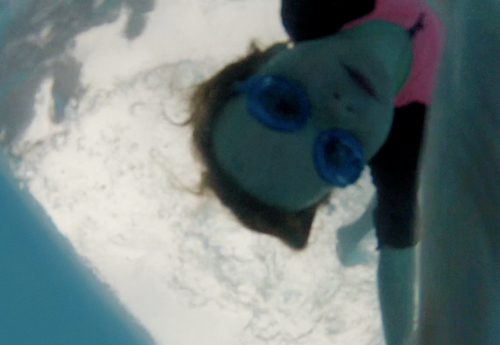 When the camera falls to the bottom of the pool, Aisha has to swim down to collect it. Brioni is delighted to see that Aisha has managed to retrieve the camera. Later, the two girls try to take a portrait of themselves together. 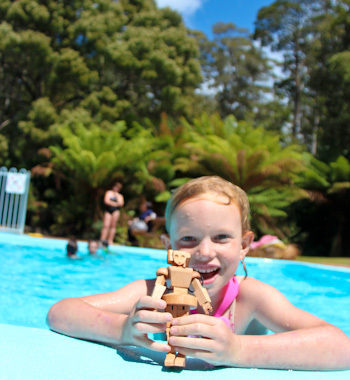 Our girls also had a terrific time playing with other girls in the pool. They quickly entered into an easy comraderie and rode around on each others' backs in a gentler version of "Chicken". 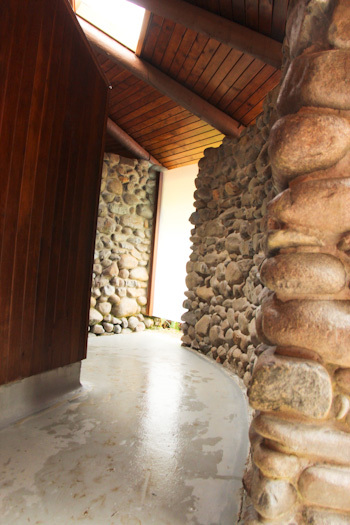 The bathroom facility contained showers as well as toilets in a beautiful timber and stone construction. I do love a well-designed amenities block! The warm pool was still too cool for me to enjoy, although I paddled with Delaney in the little pool for what seemed like a brave length of time. The pool isn’t the only attraction at Hastings. The grounds have barbecues and open fireplaces in stone shelters. The lawn is immaculate and ringed by trimmed fern trees. It’s a lovely place for families to hang out for the day, and many visitors make this their rest stop after touring Newdegate Cave just up the road. An illustration on the bottom stone shows how the thermal springs work. 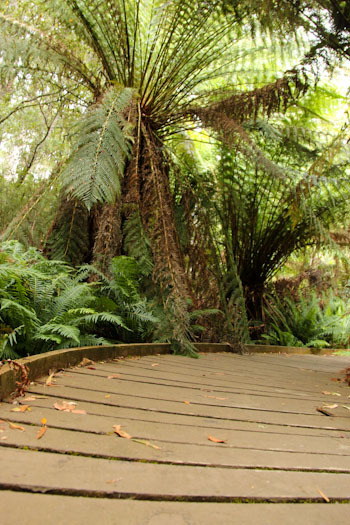 A beautiful boardwalk around the back of the premises takes us past a cold creek and the warm thermal spring. 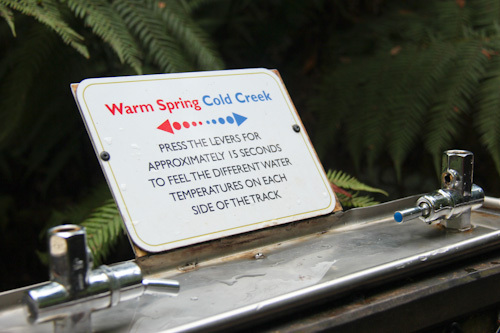 In between the two water sources, two taps can be turned on to demonstrate the difference in temperatures. 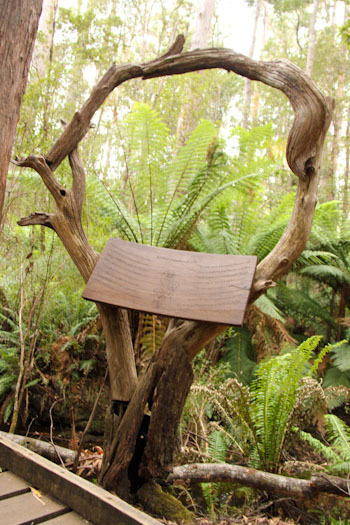 A simple, natural sculpture highlights the history of the forest. I am always inspired by natural artworks like this that integrate into the landscape, similar to the work of Andy Goldsworthy. 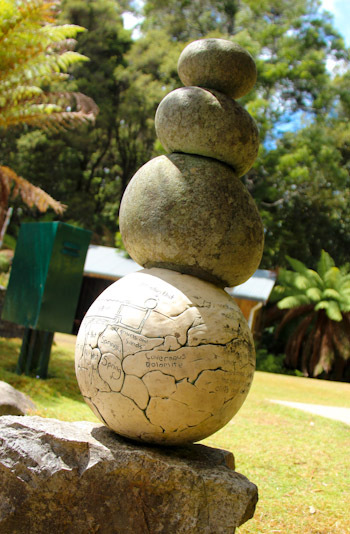 If you haven’t yet seen the work of Andy Goldsworthy, have a look here. He works with natural materials, designing sculptures that aren’t necessarily designed for permanence, but simply for pleasure. 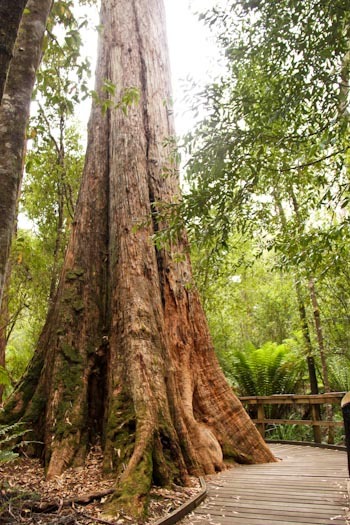 This huge, 50-metre-tall stringybark gum survived the early settlers' axes — simply because it was assessed as too twisted for good lumber. Imagine a forest full of these giants! That's what we're missing today. 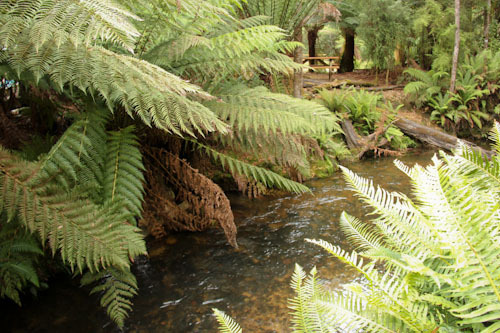 Picnic benches sit on the edge of the creek, providing a beautiful location for lunch as well as the possibility of seeing a platypus. Tasmania. It’s been too cool here for proper swimming in the many waterways we camped alongside, and so this was a perfect day out for us! The great trees remind me of the Red Wood forest in California. The trees were the largest I had ever seen and so beautiful. We live on the prairie and the few trees we have are not too impressive, so seeing trees like this are a treat! Sure looks like a beautiful place you are visiting! 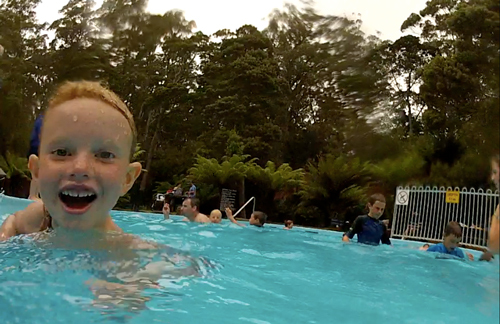 You might like to try the Peninsula Hot Springs when you’re visiting Victoria. My sisters and I spent an afternoon up there on a chilly day. 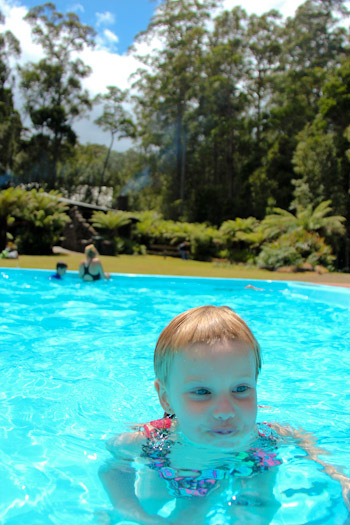 The pools are of varying temperatures in a natural setting. Some pools are deliciously hot! They’re about 45 mins from my place. I’m planning another afternoon up there before too long! Loving hearing about your travels and thank you for visiting my blog. I was wondering have the girls ever done swimming lessons? I know they love the water so do we but was windering if they just picked it up due to exposure? 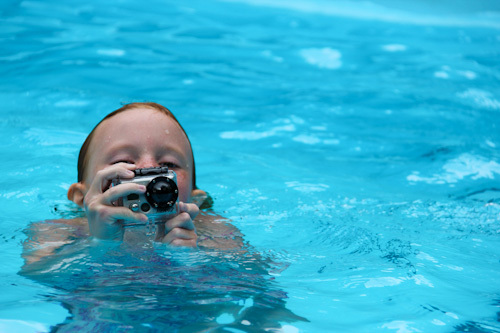 We also are budding water babies but formal lessons seem so mundane and expensive !